… with subtle switch coming up officially Thursday. We are switching it to a new site that continues the practice but changes, and hopefully simplifies or expands the options for how to works. The (new) Daily Create is actually up and running now at http://daily.ds106.us/ – it’s more like a cross-fade, The current site at http://tdc.ds106.us/ will publish it’s last one tomorrow, and the same one will appear at the new site. In fact you can submit to both- upload the photo to flickr for the old site, and tweet it out with the right tags for the new. See, today’s Daily Create (a writing one) is available at the [soon to be] old site and at the new one. The new site uses a special WordPress Theme I have been working on this year, the Daily Blank, it allows anyone to create their own daily challenge/assignment/whatever site. It’s first run was for the You Show, I have also put it into play for Mariana Funes’ Still Web, and currently it is going gangbusters for the UdG Agora project as the Daily Try. Why are we doing this? The current DS106 Daily create is dependent upon and forces users to use specific media services to submit their work. Images go to flickr, video to Youtube, audio to Soundcloud. This brings some technical issues. This week flickr’s tags are not aggregating the work of new students. It also depends on the Awesome Flickr Gallery plugin which the last few months has been less than awesome (it needs regular manual cache dumpings). YouTube actually stopped searching on tags more than a year ago. And Soundcloud? Sigh. Every time we add a new Daily Create, we have to create a fake account, because they only let you make one. And all of these limit participating to these platforms. The new site also means the categories need not be limited to media type. There could be a category for Mocking Jim Groom, for example. The new site takes responses via twitter, almost a throwback to how the inspiration for the DS106, The Daily Shoot, worked (point of reference, the Daily Shoot folded after 678 assignments). 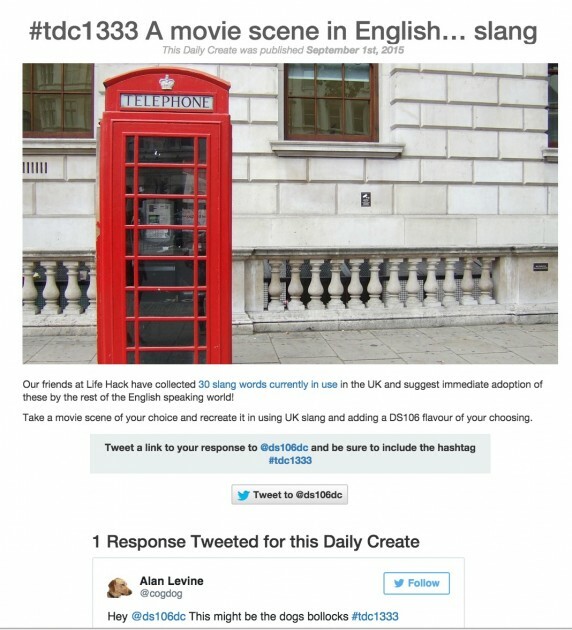 This means if the Daily Create asks for an image, it can be included in the tweet, or referenced via a link. The image can be anywhere on the net as long as its publicly viewable. Some Daily Creates (short ones) might just be composed in a tweet, others might be referenced by link. The writing ones present new possibilities. On the old site, the Writing responses were actually saved to the site, using some custom code I added in 2012. But on the new one, if what you write is bigger than a tweet, well then you have to put it online via dropbox, Google Drive, or better- your own blog. If I was teaching, then, I might suggest to my students to post their daily create work on their own blog (where they can add context and behind the scenes info), and tweet that link as a response. The responses include images and videos, embedded directly as tweets. And there is another bonus feature, because we can tag responses with the twitter account that sent it, we are able to create a personal link for each person who participated. 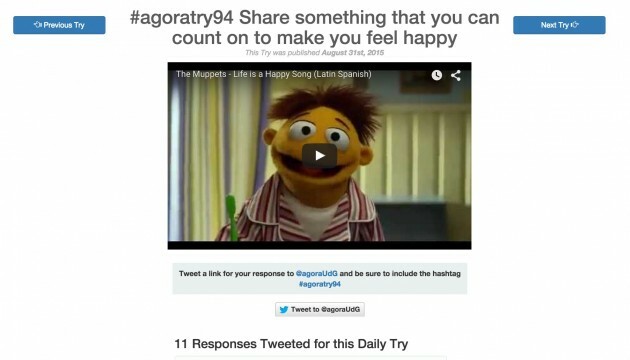 For example Sara, @saracarolinagm who has done 67 Daily Tries, has a link to show all of her work http://udg.theagoraonline.net/daily/hashtags/saracarolinagm/. This also let’s us make a leaderboard — which indicated 145 different people have done at least one. A big thanks also goes to Mariana Funes, who has taken over populating the Daily Creates. We have had many conversations where we share the big secret- Cresting Daily Creates is a massively creative act. And also to Tim Owens, who crafted the original Daily Create site in 2011. And to te hundreds of people who have done them over the years. So give the new site a try now, it’s functional, because on Thursday… it will be the only option (the current site will of course remain as an archive) (what do you think this is an LMS where we flush stuff?). Awesome. Always working on next iterations. Kudos! The Implementation Plan Scene from "Dilo Space"